Saul’s third novel – The Prince and the Whitechapel Murders (the third in the Zulu Hart series) – is now finished and will be published by Hodder in the UK on 22 February 2018. The feature film ‘Entebbe’ – based on my book ‘Operation Thunderbolt: Flight 139 and the Raid on Entebbe’, and directed by José Padilha and starring Rosamund Pike and Daniel Brühl – will debut at the Berlin International Film Festival in February 2018, and will go on general release in US and UK cinemas on 16 March. 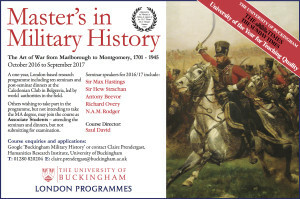 There is still space on the 2017-18 Master’s in Military History by Research programme that Saul runs for the University of Buckingham in London. Applications close on 30 September 2017. Full-time and part-time options available, as well as associate studentships (which do not require a written component, but instead give the student access to lectures and dinners). Saul has just delivered the manuscript to his new novel, the third in the George Hart series, set in London in 1888. It’s working title is: ‘The Prince and the Whitechapel Murders: A George Hart Novel’. It will be published in the UK by Hodder & Stoughton in February 2018. The film rights to Saul’s latest book Operation Thunderbolt have been bought by the US film company Participant, and principal photography on the feature film ‘Entebbe’ begins in Malta next Monday 14 November 2016. The film is co-produced by Working Title, and stars Rosamund Pike, Daniel Bruhl and Vincent Cassel. 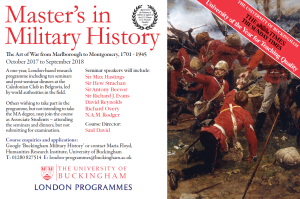 There is still space on this year’s Master’s in Military History by Research programme that Saul runs for the University of Buckingham in London. Applications close on 30 September 2016. Full-time and part-time options available, as well as associate studentships (which do not require a written component, but instead give the student access to lectures and dinners).